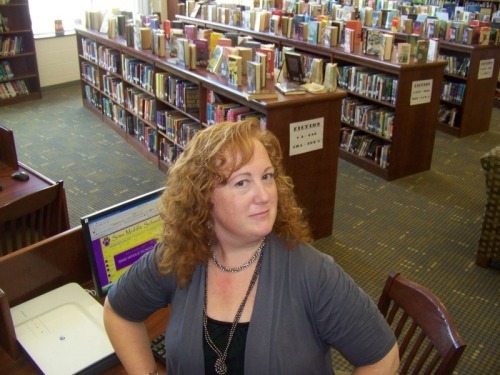 This is the photo I submitted to the This is What a Librarian Looks Like blog project. Bobbie Newman and Erin Downey Howerton are "challenging the librarian stereotype one post at a time." I really enjoyed looking at the pictures on the site and I bet you will too. I have yet to spot a bun I tell you! I am proud to be included among such a lovely group! Ms. Yingling? THE Ms. Yingling of the rocking "Ms. Yingling Reads" blog? Your majesty! I love your blog! You don't have to grow your hair long to wear a bun. You can buy a ready made one and clip it on if you like. I like the "This is What a Librarian Looks Like Project" because it shows that we are a diverse multifaceted bunch of people who don't look or act alike at all. It aims to challenge stereotypes and its fun. Anyone who is kind, helpful, has ninja tech skills and writes a mean blog can go for whatever look they want. I was just teasing about the bun comment. I can't get my hair into a bun, but I can do a french twist! Thanks for the comment and the awesomeness of your blog. Thanks Cathy Jo! It looks like they are still taking submissions. I need to do the Hold Shelf meme you told us about. Yeah, Ms. Yingling's comment made my week. I was almost going to post about it! How about lunch Monday?